Pedal pushers are slim-fitting bottoms that finish on or just over the knee. They are shorter than calf length. I’ve referred to pedal pushers as clamdiggers in the past, while retailers in the US call them capris or cropped pants. This is not a new silhouette, but it has taken a back seat in a fashion world that is currently besotted with ankle pants. Pedal pushers are structured, and made of dressy fabrics like wool and cotton blends, or casual fabrics like denim, in both solids and patterns. They frequently have a slit on the hem of the knee to increase the comfort level as you stride. Pedal pushers are especially good for larger calves because they are short and don’t cling. The hems of casual styles can be rolled to the knee, which is an especially good idea when you hack off the length of an old pair of skinnies to create a pair. I love pedal pushers, or clamdiggers as I call them. I used to wear them a lot four years ago, but stopped when baggy and slouchy boyfriend jeans took their place. I did cut a pair of old flared jeans to this length last year, but their fit is looser than pedal pushers. 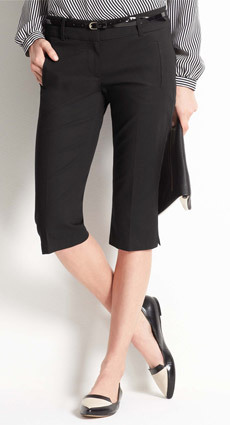 I’m in the mood for dressy pedal pushers like the ones here from Ann Taylor. Pedal pushers are more comfy than pencil skirts and look boyish in a polished way, which appeals to me. I’m a yay. Over to you. What’s your take on both dressy and casual pedal pushers? Would you wear them? 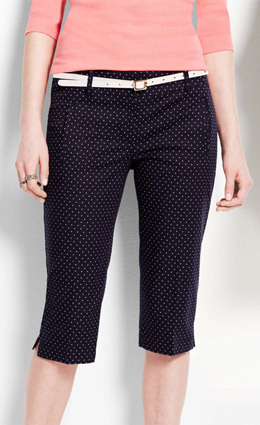 And do you think that dressy pedal pushers, like the Ann Taylor styles below, are work appropriate? oh yeah! Always loved these, liking the 50’s starlet aesthetic as I do, but not the top two skinny versions that look like leggings. A huge yay from me! This is my go-to look for summer. I prefer these over shorts. Ones with a hidden back or side sipper are my favorite versions, but they are harder to find. Big yay from me. I don’t much like my knees and clamdigger length is a great way to cover them. This type of cropped pants is more flattering on me than the others so this is my version of summer shorts. If they are long enough to cover the knee I totally can wear them for work if they are in dressy fabrication but my dress code is casual. In our hot summers, I often wear these rather than jeans or longer pants because I don’t love showing my not-so-fab knees and thighs. If I had better legs I would wear shorter shorts more often, but it is what it is, and these are more flattering on me. It’s not my favorite style because they don’t seem at all edgy, but for me it’s a compromise. I try to make it work by pairing them with interesting tops and cool wedge sandals. I think they can be work appropriate depending on the fabrication and styling, as well as environment. I know that they were for me, back when I worked in an office. I find them much more work appropriate than actual shorts or mini skirts. I like the look if they are slim and tailored as shown here. Too often I see these looking frumpy, but I like these. Not sure if I would wear them in my “business casual” office, though. I am currently searching for some clothes for a European trip this summer and could see these styled with loafers (as shown above). I’m not sure … I don’t think I own any pants of this length and I might like them, but I wonder how flattering they are if your most solid body part is muscular thighs. I actually think shorts might be better. I’m on the fence, but I would definitely try them. Another big yay here! I also wore denim versions a lot a couple years ago, and still wear them occasionally. I even have a dressy black pair that I love. I actually tried the Ann Taylor version and they sadly did not work for me The opening around the knee was too wide, not snug at all, so they looked like loose long shorts as opposed to pedal pushers. They would not be appropriate for my work, because of safety issues, but I can imagine them working well in any work setting where regular shorts and shorter skirts are allowed. I like them. A denim version is a perfect idea for a SAHM/WAHM. I think they are a great alternative to shorts in nicer weather and more comfortable sitting at a desk. I love them! I especially like the narrower, skinny type. These, to me, are much better than ‘crops’ since they hit at a more flattering spot on the leg. I have some of these in a light stone color and wear them all summer. Will be looking for black Not work appropriate for my office, but I can see where in a more business casual setting, the combination clam diggers with a dressy jacket would be great! I like these on others, but not on me. I always end up feeling “stumpified” when I try them on. Yay from me too! I started to like this length last summer when I was chopping off some old jeans and the length I decided on was just below knee cap. I’m all for casualising the look for my mostly at home lifestyle. As for work appropriate for dressier environs… I like it and as long as the company guidelines allow the style, then why not? I like them as an alternative to shorts, worn in a relatively casual way, and I prefer them cut quite slim and close to the leg and worn with flats. For less casual occasions and with heels I usually find slim ankle pants more elegant, but I really like the last look you’ve shown, with wedge sandals and a jacket thrown over the shoulders. Yay from me! I have always loved these but the proportions of the whole outfit have to be just right. A summer staple for me – I sport white denim and faded denim capris regularly. The more dressy clamdigger is very appealing – but not really suited for my lifestyle. Viva, I am waving at you. I wear bermuda length shorts a lot in summer. Even though my knees are not my best feature, and increasingly I might like to cover them. So in theory I should be a huge yay for these. But in practice I’ve found them quite tricky. It is partly a proportions issue — my thighs are my biggest part, and they are also longer than my calves. So if I wear a pant like this without a heel, I look off-kilter somehow. I also need a bit of a heel with a midi skirt, so it makes sense. But midi skirts have the advantage of disguising my long rise. So they are actually a little more do-able with flats. So here is my wishy washy answer. A big yay in theory, and a big maybe for real life. IF I can find exactly the right refined yet casual wedge heel for wearing with these, I will be an eager experimenter. 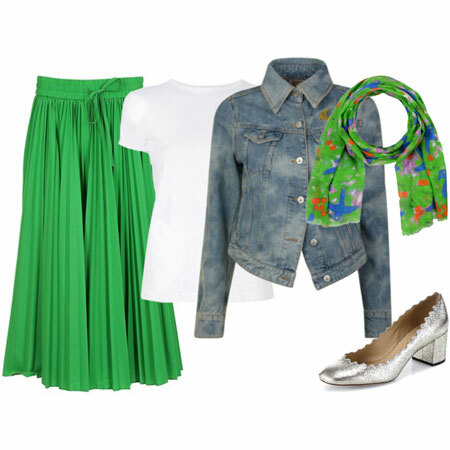 I love this look – very 50s! The name “pedal pushers” makes me want to put on a pair, don big sunglasses, and hop on my pink bike with the Nantucket basket on the front. I love pedal pushers. I’m a bit on the edge wearing them for work but have done so for some of my more casual business meetings. The last outfit would be more work appropriate. I like them but I don’t think they would be for work. When I was looking at the top two examples they are so fitted, I thought they were cropped leggings. I do wear cropped leggings of this length with a tunic for very casual wear. I also have one pair of denim clams that I love but again they are casual knock around. I think the style is extremely cute and I look forward to seeing how people style it. I don’t think the dressy version is practical for me as it would be work wear. Since I run cold, I prefer full length pants or a skirt that I can wear with tights or hose to combat the arctic a/c!! But for those that run warm, I think it’s a very cute and graceful look!! 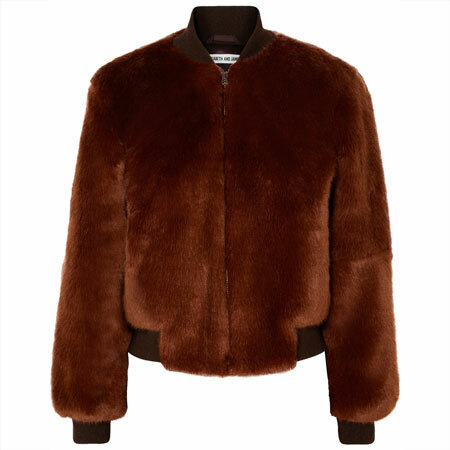 I like this as an option for warmer weather. I have not had them on in ages and would have to see how they work with my proportions and footwear. I also have a general aversion to any cropped pants that flare out at the end, so will see how it works to have a sleeker hem. Thanks for all the ideas, Angie. I am a definite maybe. Yay, if & only if, they end at the knee – like in the last image. And I always wear these with a fitted & tucked in top. No long tunics that hit at thigh level – I tend to look very frumpy in that. Resounding Nay – if they are any longer as it makes me look stumpy. I would rather wear shorts or slim-fit bermudas instead of these. I’m a yay – I had and liked them last summer, and predict something similar this summer! I prefer what I think of as Capri’s (the longer, narrow Audrey Hepburn style) to Clamdiggers. I like cropped pants better when they are narrow all the way and often Clamdiggers seem too loose around the hem for my taste. I really like the Alexander McQueen Zip Pants in the first picture. Yes! Love these. I have several denim versions. Think I’ll add a couple work versions to my list! I have always liked this look and would love a pair a bit dressier than the denim version I have now. I am not crazy about what happens when the area around the knee flares out too much which happened when I chopped a pair of bootlegs. An absolutely gigantic YAY from me!!! These are one of my favorite items to wear when the weather warms up. They are appropriate in my office as long as they are a dressier version and I love pairing them with a light weight blazer to make a “summer suit”. A big YAY from me! I think they look awesome on most anyone. Angie, you taught me the joys of clams/pedal pushers. I’ll join you on team yay! I like them for their more refined look. It’s kind of relative, but they’re more refined than traditional shorts. So they help me look pulled together in our very hot summers. Yes, I love these, and I especially like the dressier versions. I don’t actually have any, but I’d be open to them. I think they can be totally work appropriate in the right environment. Unfortunately, I don’t think they would work too well in my work environment. No matter, they can work so well outside the office that I’d be open to a pair if I found the right ones and the right fit. 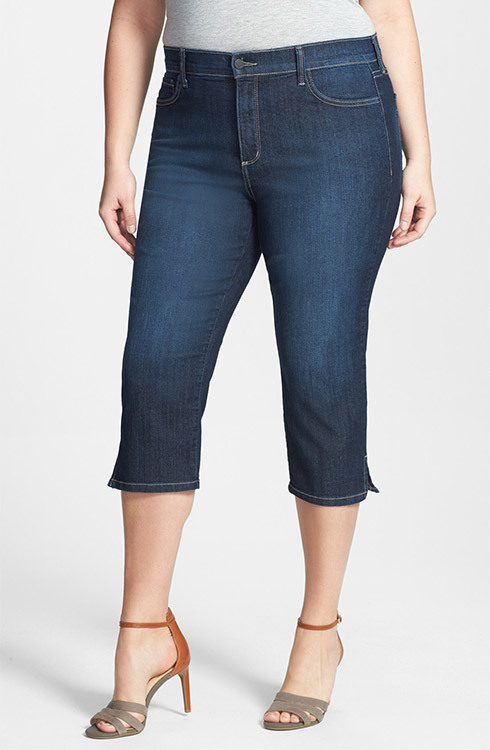 I have one or two pairs like this and end up wearing them a lot, so I guess I am a yay – have never thought about it, but I’m realizing as a short (5’3″) hourglass with pretty big calves, these are a more flattering cropped pant than the usual capris or straight shorts, which just make me look stumpy. have only ever worn on weekends but will see working up a more dressy office look this spring and summer. Any suggestions/ideas of how to make these work for my kind of figure much appreciated! Like gryffin, I have cropped leggings that look like pic 1! And I use that as my exercise gear. I do like the polka dotted one that hits on the knee. But I wore bermudas and pedal pushers all throughout my life …. So much so that I am over them. I will give this a pass and enjoy it over others unless I find a seriously cool pedal pusher! never worn before, but that first picture with the blue tunic makes me want to run and find a pair (and the blue tunic)! I am still influenced by 4 years ago Angie and thus still wearing them! I love them so long as the entire knee is covered. The ones that expose part of the knee are veering into poison eye Bermuda territory for me. I also prefer a tapered hem on clamdiggers, so I don’t love the slit or wider openings. Caveats aside, I like these a lot and wear them often in summer. I have a couple of pairs of slouchy silky ones with banded hems, and a couple of pairs of chopped and rolled denim. I also sometimes push my light colored, shorter summer bfs to this length. I have some in my closet that I hope to wear this summer. Mine are only in denim, but that works for my casual spring/summer, and mine are in a dark, dressy wash. If they fit well on the thigh — close, but night tight, and end at just the right spot with no flaring out, they are flattering on me. As you know, Angie, my calves are powerful and curvy. I used to bemoan this, but now I realize that they match the rest of me and keep me from the appearance of cankles. Hmm… not sure. The length looks a little off to me but I do love leggings at this length. The Ann Taylor look is nice but when I am that dressed up at work, it is usually for client or investor meetings and I tend to want to look more conservative for those. I guess I will wait and see how others on the forum style these. For me, it would be a bold look for work. I know people would notice the new pants. These look like a fun option to add some variety to shorts, especially for someone who likes to sport Bermuda length shorts. I don’t see these working out for my office, because they still remind me of shorts, compared to a cropped trouser, which more closely echos the look of a full length trouser. I am very curious if others see this style sported in their offices. A few years ago I tried Bermuda shorts for work with a heel, and while the look is polished, it wasn’t well accepted as a professional look, which surprised me because I work in a casual office setting and jeans everyday is the norm. It could be that the shorts and heels vibe was just too trendy for my office, even though the dress code is casual. Yay for me. Although I love skirts, shorts, or longer ones like these clams are much more practical for some activities. However, will not be appropriate at my business casual work. I’m in the YAY camp for this look. I have the large knees/calves/cankles going on but find that this particularly length smooths out my leg (if there is enough drape at the knee) and if I wear a wedge shoe them it elongates enough to tear the eye away from my stumps. It’s hard to find this length where they are large enough at the knee/calf area (for me) but fitted nicely elsewhere. Now to find more .. I love that last look and the second look with the blue top. Gorgeous. Yay for me! I have a black pair that I just love. Yay from me! These are really cute. I like the dressier versions, so long as they are very tailored around the knee. Like Karie, I would really love to see them with a side zipper because to me that look is more retro and feminine. I don’t think they would fly for most biz-cas work environments because they look more like shorts than pants. I’ve woken up to lots of pedal pusher fans. I’m right there with you. I wear them as “shorts” like some of you do too. Viva, actually to my eye, pedal pushers are very flattering on muscular thighs. Suz, I would love to see you in pedal pushers. My hunch is they will look terrific. Sveta, I would also wear (and have worn) dressed up dressy pedal pushers to work in a business casual office. To my eye, they look MUCH dressier than khakis. Kay and Neonginger, I 100% agree that pedal pusher lengths are flattering on all body types. Tanya, that surprises me – since we wear a similar size. I tried on the AT dressy pair and found them plenty slim fitting on the leg and knee. I tend to prefer my fits roomier than you do, so perhaps that explains it. Or, I have larger knees. Gryffin, I also prefer full length or BF jeans for arctic A/C. Shannon, a Summer suit sounds fab. Alecia, high five. Pedal pushers are more refined than short shorts. Anne, you wear pedal pushers well. Diana, you’re heading into fun knickerbocker territory with your pedal pushers, and I like that look too. Beth Anne, pedal pushers are a brilliant match for powerful and curvy calves. 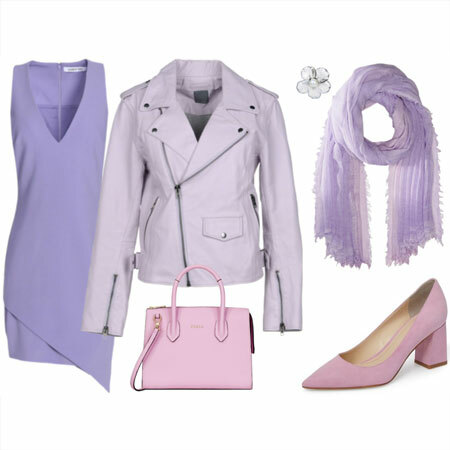 Lisa, with a blouse and blazer, or boxy cropped jacket matched with dressy shoes sounds about right for a business casual office. A huge yay for others, but a qualified one for me. I’m not quite sure if this look will be a flattering one for me right now. Since I work from home, I’m not apt to be doing the dressy versions (which I really like), and I’m worried that the more casual versions could be frumpy and stumpifying on me. I’ll have to see if I come across the right pair. I do like the ones on the right in picture #2. Perhaps if I find black ones (or another dark color) that are nicely tailored, slim-but-not-too-slim, like those. I would have occasion to wear something like that during the summer. Sorry to be a downer but I have a bit of a poison eye for this look after seeing masses of women wearing ill-fitting and generally unflattering clam diggers. I much, much prefer the dressier variety, well tailored and cut immediately under the knee cap and worn with a heel. Even a smallish heel lifts the whole look in my eye. I like the look on others. I had a pair that I liked but I am now into slouchy BF jeans or ankle length pants. I like short shorts (not on me!!!!!) or most of the leg covered. Anything in between doesn’t seem that flattering to me these days. I can’t wear heels but the right wedges are okay for short periods of time. This is part of the reason. I have full calves so must choose pedalpushers very carefully. Either just knee length or below the calf buldge, then they can be a flattering warm weather pant for me. Knee length allows the eye to read the whole lower leg together and the full calf isn’t quite so noticeable. And covering the fullest part of my calf disguises it comepletely. Actually women here in OK wear these all summer long, and they are perfectly acceptable as business casual. I lurves them, and just assumed they were frumptastic – but didn’t overly care once the temps hit 100F/40C. Yes, sure, I like them quite a lot. I don’t currently own any, but I did a few years ago. I’m not sure why I donated them. I think I went all of last summer without wearing them and decided to pass them on, but I can see picking up another pair. I think part of the problem was that they were black (not the best summer colour), and not the most comfortable — so clearly I need a better pair! I have a similar denim pair like the one shown above. Love to wear them as they cover my camel knees and are a bit cooler in the heat of summer than longer options. Angie, I Know. They fit fine on the legs/thighs. I do not think you have larger knees. I think that the problem for me was that the tapering around the knee wasn’t enough. I have very skinny calves, much smaller then my knees, so the opening around the knee wasn’t tapering towards the calves, but sticking out. I guess like an inverse flower pot effect if that makes sense. LOVE! Everywhere except the office! I’m going to say maybe on these. My legs are my best feature, so I’m apt to spend my money on the dressy short trend first. But never say never, pedal pushers look super comfortable! I suspect that they could be office appropriate for savvy YLF members, but the potential to get them wrong is big otherwise. Yay! I absolutely love them. I’ve worn them in the past and will definitely wear them this summer. I love this length in rolled denim, casual fabrications (and cargo/utility styles etc), AND dressier suiting! These *are* my shorts, because I prefer not to show my thighs. Yay. Much prefer them to ankle pants or longer “capri” lengths. I never wear either. This is the length I prefer for “shorts” actually. Yay from me! They provide more coverage than shorts and are a great alternative when you don’t feel like wearing a dress. I don’t know if I’d wear them to work, though. Even in a dressy fabric, the overall vibe might be too casual for my particular workplace. Like Suz I’m going to say yes in theory. I am a little self conscience about my larger calves so they would have to be the exact right length for me to wear them. I have a feeling that my sweet spot will be right below the knee, like the last pair in your post. I also think I could get away with these at work in the hot days of summer. These are. . .okay. . .but I wouldn’t consider them office appropriate. What I’m really hoping will come back for casual wear is high-waisted, pleated, wide legged, mid-thigh or lower (I can always buy non-Petites!) shorts. A really full leg makes my already full legs look thinner by contrast. Most of you are no doubt shuddering in horror, but if it ever comes back as a fringe trend, it means I will be able to pick up a pair or two on deep discount! I hate going against the grain as this group is wise in the ways of fashion! But I must admit, I do hate clamdiggers … much prefer the cropped around the ankle look. But if anyone could make them look fab it’s you lot!!! WOW. Go Team Pedal Pushers. K. Period, I love that shorts outfit. Chic. They look cute but I tried these on the other day and found I didn’t like the way they felt behind my knees. The fabric rubs the tender skin there even on my skinny legs, and I can’t imagine many people finding this cut to be comfortable. So with you torontogirl !! Not in love with this half mast look. Long to the ankle length or lower, or wear them short. Oh well, I’m a meh leaning toward nay. I used to wear them during humid East Coast summers, but I’m too pale and untall for them to really flatter. It was a heat-beating stopgap, really. I don’t see this silhouette as fresh or modern or even remotely interesting. I can totally imagine it being fab on others though. Love these and have been wearing them for ten years or more. I wear them in place of shorts as I find them more flattering since I’ve gotten older. I have them in white, black, khaki and jean material. I have some for casual everyday wear and some I can dress up. Love! 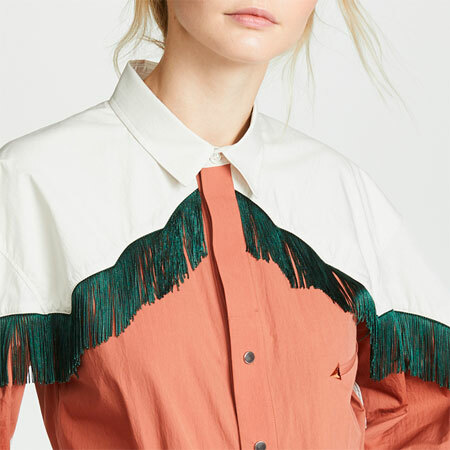 I like this look in principle, but when I try to buy I seem to always end up with something that looks more like Bermuda shorts, maybe because I’m tallish. Don’t get me wrong, I like Bermuda shorts too, but it seems like this is the pants equivalent of the midi skirt, and so those few inches below the knee are key to get the proportions. I wore cut off skinnies rolled to this length for a whole summer when I was working in a very hot factory that required pants ‘below the knees’. They were very comfortable and didn’t look bad with boots or sneakers and tees. Given the name, they were especially good for biking to get supplies :). Another in the yay camp. I love them. I don’t like to wear shorts and thought my only options were skirts or pants, but I found a pair on sale at the end of last Summer and they were a revelation! I plan to sew a pair this Spring. These are not work appropriate for me, so I would not select a dressy pair. I do prefer longer shorts for summer casual wear, and I would certainly consider pedal pushers for that. Oh, I love this type of pants. I never thought of it before, but they’re a staple in my wardrobe. I wear them to work in my semi-casual office environments – and also the bakery, where shorts are not allowed and it gets hot in summer! Love them. Absolutely a staple in my wardrobe. These refined pedal pushers I love. The term though reminds me of cutesy below knee pants with bow ties on the lateral edges that I remember wearing from my teen years. I like calling them clam diggers or cropped pants. I am going to try the ann taylor ones. Another Yay for clam diggers. This length works really well for me and I wear them in place of shorts. I think it really depends on proportions of your leg to make it work. I am comfortable in short shorts and have fairly strong legs but always feel that I look out of proportion. Longer length shorts, Bermudas to clam diggers, work great for me. I think it may be due to my lower leg – knee to ankle – being fairly long. So a big yes from me. I do think there is a fine line between great slim stylish clam diggers and frumpiness lack of style clam diggers. Thanks for the great links. I will be on the hunt to upgrade a couple of pairs of claim diggers for summer travel. yes I wear them and I wear them to work (then I wear jeans to work : casual work environment). I wear the on-the-knee type – and I thought they were called “bermudas”. I don’t know how I would dress in Summer without them (given that dresses and skirts look so odd on me). They’re my Summer jeans (half of them are cut-off jeans actually), so pairing them with tops is a no brainer : usual shirts and jackets. Add ballet flats or soft loafers and I’m right in my preppy comfort zone. love the look on others – on me the length is just.not.good!! – I’ve got some pretty meaty thighs and legs that are proportionally way to short for my 5’9″ self – I look like a giant oompa-loompa in pedal pushers – so I’ll sigh wistfully from the bleachers and cheer you all on!! Big yey from me too. I will absolutely wear any of the Ann Taylor styles to work with a silky button down or banded/welted sweater plus dressy wedges or Oxfords. 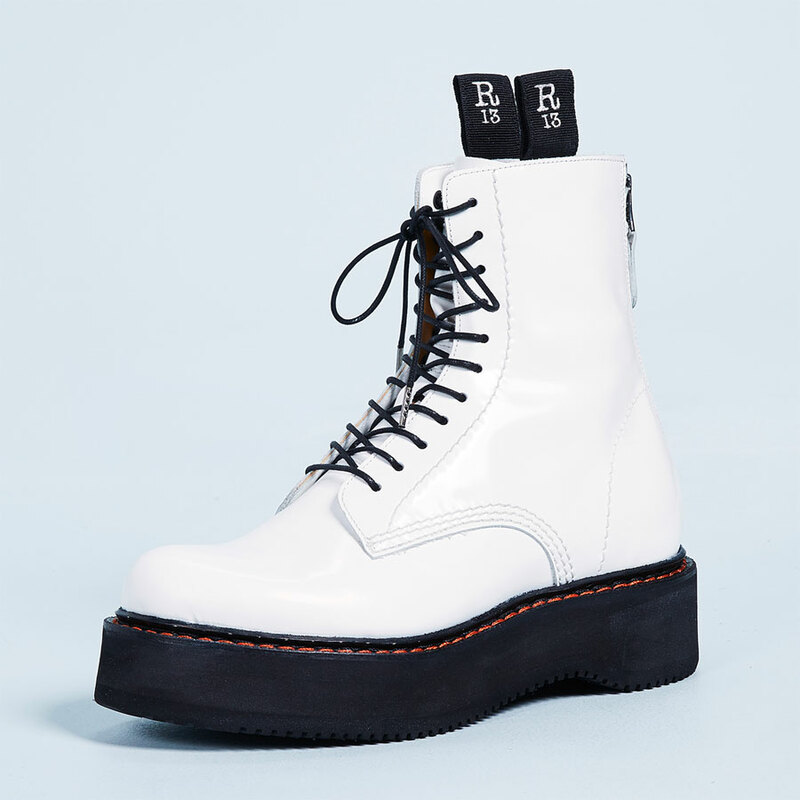 And I would wear them with Converse low tops plus a casual fluid button down or Tee for weekends. And I know it’s because “they look boyish in a polished way.” I’m glad they are back! A huge yay from me. As I like to keep my knees covered, they function as my Summer shorts. Plus I am all over the dressier versions as they are very much in line with my polished style preferences. And thank you for writing this post today, you just reminded me that I currently don’t have any pedal pushers in my closet I too am loving the Ann Taylor ones. Yay! these have become my summer uniform in denim, usually rolled. I want a pair in black and in chocolate brown, and hope to get to AT soon for black dressy ones. As far as the work place, I don’t know. It would depend on the workplace. It would seem that if everything looks polished and professional and tattoos are not being revealed, that they would be accepted. Thanks for reminding me of this silhouette. Of course my eye went straight to those fabulous McQueen pedal pushers. Gorgeous! So tailored and chic. Wish I had an extra $800 around to splurge on them. The Ann Taylor versions are more practical for my lifestyle. They would work really well in my work capsule. I usually wear denim shorts but a cloth short is so much more polished. I love clamdiggers. The length suits me much more than capris that tend to make me look like an oompa-loompa. Love the AT version. I am past my prime for shorts so these are a great substitute for me. Yea, here. One of my favorite styles for the summer. I love the look – I’ve always been enamoured of the Doris Day/ Sandra Dee thing! …but not on me. I’ve finally come to terms with the fact that my short, athletic stems are done zero favours by this style. I’m belatedly adding my ‘yay’ vote as well. As long as they’re narrow at the opening and stop at the right length (depends on the individual wearer), I’m all in favor of capris/clam diggers/pedal pushers and wear them all summer long myself. The trouble starts when they’re not tapered and are wide at the opening; those look so unflattering. And like any other kind of pant, the total outfit matters: nice shoes and top help to lift the whole look. Love this length because I won’t wear shorts in public, but usually mine are much more casual. I may give a tailored version a try. I’m more taken with the black and white shoes with the Ann Taylor version! I own 3 pairs of pedal pushers that I bought at Ann Taylor last summer, and I love them. I think they are dressier than shorts, and they are slenderizing. I hope I am able to find more this year. I bought some for summer but they didn’t get much wear – it was either too hot so I wore dresses or there was A/C so I wanted full-length pants. Like Diana I have a silk pair with zips that be pushed up or down so they can look like capris or knickerbockers I wore them a lot. I like the dressy ones a lot, though have yet to find a pair that suits me. I much prefer wearing shorter shorts, but as we don’t have enough weather for those, clams make a lot more sense for “hot but not actually hot” days. I would absolutely wear the dressy trouser-y versions to my creative-casual workplace. Denim versions not so much, at least not for myself; if I’m wearing denim shorts I much prefer exposed knees. I do wear knickerbocker-style long shorts (where the hem is cuffed tight on the leg just below the knee, and the pant poofs out all around) quite a bit and have slim culottes this length which I really love, but just can’t seem to find a tapered pair of pedal pushers that I like for some reason. I’m debating trying the AT ones; their pants fit 50-50 with me, though the ones that fit are awesome. Perhaps in the navy? I wish they had top entry pockets, that’s what’s making me hesitate. Yay, I love these. I have a very old pair of Gap ones in tweed I wear in winter with thick tights and/or long boots. I have been known to wear plainer ones for work with a blouse and jacket and they don’t look at all casual. My fave denim shorts are actually these, ending just below the knee. Thanks for reminding me I really need to replace those, after 10 years the elastane is bagging! I have ‘athletic’ calves and this length makes my legs look shapely rather than chunky – thats my opinion though I suppose! I especially like the last pair. To me they look a lot like the long bermudas you’ve shown here on the blog (cobalt blue, from Club Monaco)–and which I think Suz has, too. Just below the knee is a length I like to wear. I think I’m less a fan of pedal pushers than I am of long bermudas, technically. Oddly enough, when I used to wear shorter shorts, I had poison eye for bermudas on my legs; I thought they just looked terrible. Whereas now, I love the longer length shorts. It was probably something about the proportions of the older bermudas, or adjustment of my eye–or both! I have a poison eye for this look because it is a staple of fumptastic people where I live. They aren’t “in” this year because they have never been “out” where I live. Indeed, many people still wear the kind rachylou described with the bows on the sides. They are commonly worn with cotton t-shirts with embroidered designs on them (the summer version of a “teacher sweater”). As for work, I think this must really depend on where one works. To my eye they are not professional at all, nor would they have been acceptable in any office I’ve worked in. Saying they are dressier than short-shorts or mini skirts isn’t saying much, as neither of those are acceptable in any business environment, either! Yes to this style from me too. I wear this style a lot in our hot, humid summers as I can’t stand any fabric on my legs and ankles. The slim versions are very stylish and can easily be dressed up to be work-appropriate. My preference is for a fabric with substance and paired with loose, drapey and floaty tops…..almost a bohemian style. Right at the knee, they can work. I kind of like the polka dot pair, but I can’t decide! Below the knee, at least with my biker’s calves, yikes — looks very frumpy and even a heel can’t quite achieve defrumpification. Hm, I realized that it’s pretty much the same for skirts for me too. And I have to agree with the above poster — where I live, pedal pusher length has never gone out of style. Many women wear them. A big fat no!! They are hella unflattering…to everyone! I can’t think of a more unflattering length of pant and I don’t understand why so many people love them? They make that skinny skinny model’s 7 foot long legs look stumpy, what do you they they do to mere mortals?!?! Plus they always have that mid-western frumpy middle -aged mom who’s kind of given up look to me, no matter how fancy a fabric you cut them in. I have pedal pushers that look almost exactly like the ATs above and they are almost threadbare. These look like the replacement I have been looking for Angie! Anyway I love this style and will try to dig up some pictures later on. I favour this look as it conceals my ( ahem) ” fluffy” thighs. Which trust me aren’t my best feature. Also this length is accepted in my workplace’s dress code. Yes! I am teaching a course at summer school and the dressy ones would be an excellent alternative to dresses and skirts, probably more appropriate than city shorts. I always found them adorable. They work on me because my bottom half is longer than my top half, and they are a nice alternative to shorts and dresses for me in the summer. I love dressing up the more refined versions with kitten heel sandals, and as far as I can tell, they are office appropriate in Italy. My SIL, who is a manager and normally needs corporate wear, wears them in the summer with dressy sandals and pumps to work. I add my vote to the “yay” column. But as several others have said I think tailoring and outfit proportion are key. But then, that’s true of almost any outfit. A little unsure about office wear. In the right office, I suppose. Do they make us look short? I’m a yay for sure. I especially love the adorable polka dot Ann Taylor pair. My only problem is finding some that work on tall girls. A lot of time they’re too short and therefore no longer pedal pushers but instead are walking shorts. I like walking shorts, but I’d prefer a true pedal pusher. I’ll keep looking though; they’re adorable. I like these ones, they are beautiful, once I used one. I like them here with flats but not heels. I have a pair of skinnie jeans that I cut into pedal pushes that I wear when I think shorts are too revealing but the jeans are too hot.